NYLPI filed an amicus brief—or “friend of the court” brief, in simpler language—to help defend New York City’s waste equity law, passed in the summer of 2018 to address the overburdening of communities with most of the city’s waste truck traffic and tonnage. 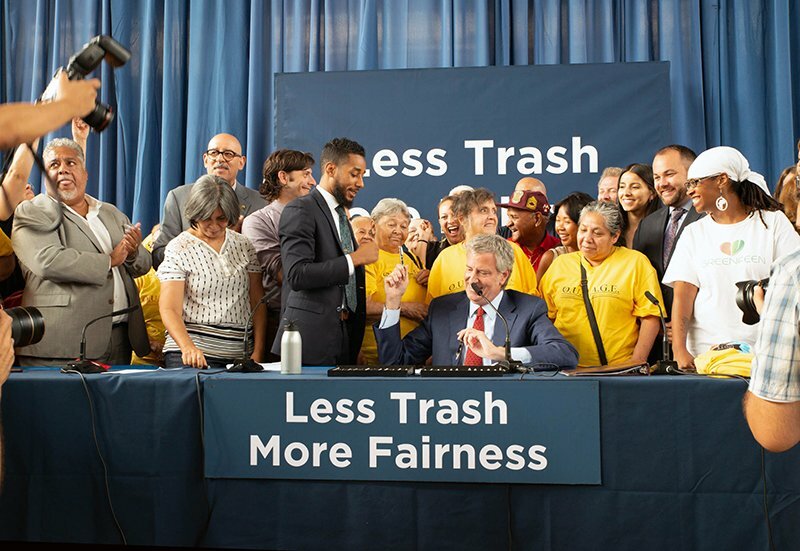 NYLPI was instrumental in getting local law 152 passed in the summer of 2018, after advocating or more than a decade, and when the waste industry sued to try to block the law, our allies in city government asked for our help in elevating the community voices who stand to benefit from this law, and be protected by it. Communities in North Brooklyn, Southeast Queens and the South Bronx, neighborhoods where 75% of New York’s waste has been processed, for years, will be protected by reducing the capacity at the waste facilities in these communities. The law also incentivizes recycling and exporting waste by rail, to reduce truck emissions and traffic. The law also protects any other community from becoming overburdened as a result. The waste equity law, which limits the longstanding over-concentration of waste transfer station impacts in low-income communities and communities of color, was attacked in New York County Supreme Court by a group of waste hauling organizations. NYLPI filed in support of the City’s motion to dismiss the haulers’ case, representing New York City Environmental Justice Alliance, Organization United for Trash Reduction & Garbage Equity (OUTRAGE), International Brotherhood of Teamsters Local 813, and Cleanup North Brooklyn. The amicus brief is here, along with the affidavit of Eddie Bautista, a former director of community planning and organizing at NYLPI, and now Executive Director of the New York Environmental Justice Alliance, and a statement of interest outlining the roles and responsibilities of the other amicus parties. NYLPI Co-Publishes New Report Documenting Severe Dangers in Waste Hauling Industry Crashes involving private sanitation trucks have doubled.